TipRanks’ earnings calendar provides users with a simple and effective way to find stocks with upcoming earnings dates that have been recommended by the best-performing sell-side analysts. 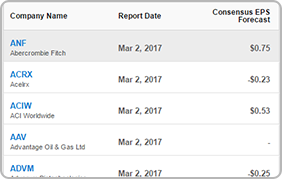 Find new investment inspiration by tracking companies’ earnings announcements. Earnings announcements are a time of stock price volatility as crucial results are released revealing how the company is performing and giving guidance for the year ahead. Investors can see if earnings match a stock’s hype and, if they choose, take advantage of this stock volatility to buy or sell stocks. TipRanks unique algorithms track over 4,700 Wall Street analysts and ranks them using objective, unbiased criteria so that users can see, out of all the companies with upcoming earnings announcement dates, the stocks that the best-performing analysts are recommending. Earnings per share (EPS) is the portion of a company's profit divided by the number of outstanding common stock shares and serves as a valuable indicator of a company's growth & profitability. To create your own personalized earnings calendar first filter the stocks by market cap size, 8 different sectors and analyst consensus (strong buy, moderate buy, hold, moderate sell, strong sell). Alongside features enabling you to see the consensus EPS forecast and the reported EPS, TipRanks has added functionality to the calendar with earnings history graphs so you can monitor how the earnings increase or decrease over time. 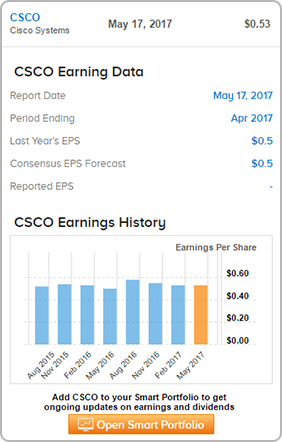 Here for example we can see how Cisco will report earnings on May 2017 for the period ending April 2017. Its EPS for last year was $0.5- marginally below the consensus EPS forecast of $0.53 for the upcoming earnings period. Click on a date and the stocks with that earnings announcement date will appear in a list, similar to the one below. Two valuable additions make this calendar unique- the analyst consensus rating and the average analyst price target. How does this data work for you? The data is compiled so that in one glance you can see the overall analyst rating or average analyst price target for your stock. You can understand the overall market sentiment on your stock while your flicking through the calendar. For example, here we can see that the analyst consensus rating on Amazon is strong buy. It’s that easy. 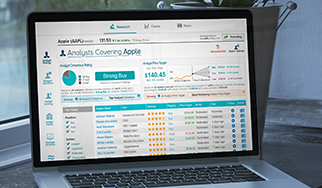 Even better, you have the option to select results from only the best-performing analysts so that you only the consensus and price targets from the analysts which consistently outperform the market are included in your results. 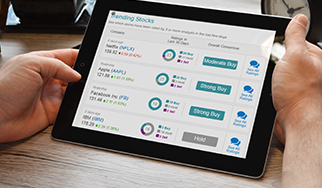 Stay informed by adding the stock to your Smart Portfolio to get ongoing updates on earnings announcements. Have a question about the TipRanks Earning Calendar?